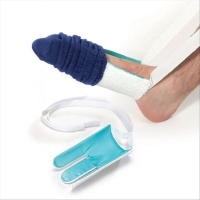 A stocking aid may assist you if you have difficulty bending forward to put stockings on. There are flexible and rigid styles available, and some are floor standing (Dilks and Green, 2005). 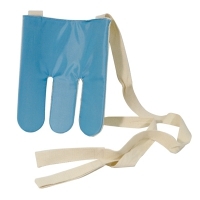 A flexible stocking aid is cone shaped and is made of plastic or fabric, usually with two holes at the top where tapes or ropes are attached. 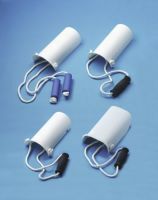 Rigid stocking aids are made from a plastic semi-circular tube with a long handle or two tapes or ribbons attached. 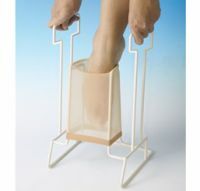 Floor standing stocking aids usually consist of an plastic coated frame, some have handles (Dilks and Green, 2005), DLF (2008). 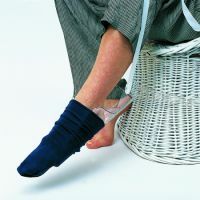 Many sock aids may also be used to put stockings on, some are listed in this section. 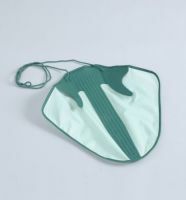 Hold the semi-circular part (gutter) of the stocking aid between your knees and ease the stocking over it. 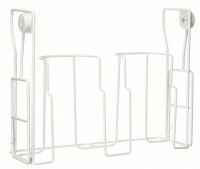 If you are using a floor standing stocking aid, this may be placed on a flat surface for you to ease the stocking over it. 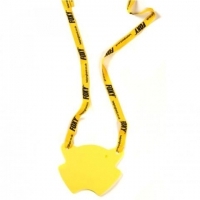 Place the stocking aid onto the floor using the handle/s or by holding the tapes or ribbons. Slide your foot into the stocking. 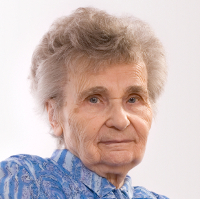 If using a flexible or gutter style aid, you may like to press your foot against a firm object while you pull the gutter up over your heel and the back of your leg. Pull the gutter up until you are able to reach the stocking with your hand. Remove the gutter and pull the stocking up to the required height (Dilks and Green, 2005), DLF (2008).